Development of tauopathies — a special class of neurodegenerative diseases — in Drosophila, resembles its development in humans, much more closely than previously thought, says a new study by scientists at the Department of Genetics, University of Delhi. The study was published in the journal BBA-Molecular basis of disease. Contrary to previous studies in fruit flies, this team found neurofibrillary tangles (NFTs) in Drosophila, when the flies were artificially induced to produce wild type and mutant forms of human tau protein. Tau is a microtubule-associated protein, which plays a critical role in tauopathies, which are characterised by hyperphosphorylation of tau and its subsequent deposition in the brain as NFTs. 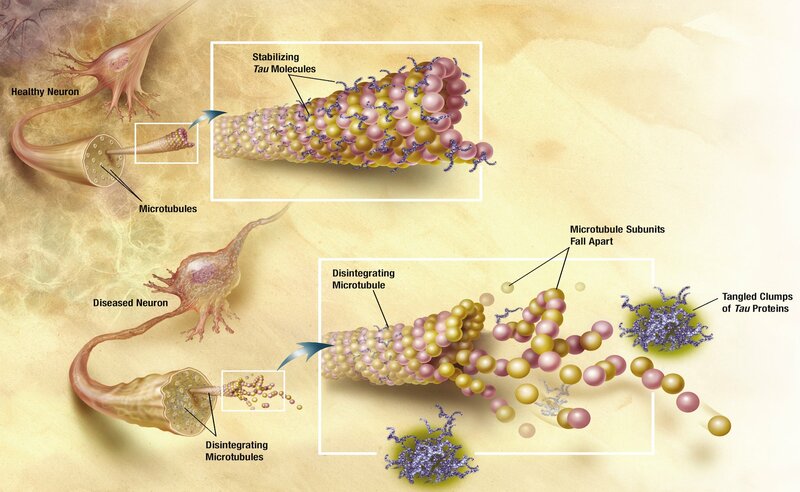 Some commonly known examples of tauopathies are Alzheimer’s, dementia, and Parkinson’s disease. Drosophila has been used as a model organism to study human neurodegeneration for quite some time, however, neurofibrillary tangles had not been reported before. “This study suggests that tau pathogenesis via NFT formation is (evolutionarily) conserved in Drosophila and humans”, says Surajit Sarkar, assistant professor, Delhi University and principal investigator of this study. The team of researchers introduced genes expressing wild type or mutant forms of human tau (h-tau) in Drosophila and studied their expression in the neuronal tissues. They observed Drosophila larval eye discs and adult eye sections to understand the phenotypic changes brought about by h-tau. In the eye sections of 5-day old adult flies, both wild type and mutant forms of h-tau showed signs of mild to severe human neuronal tauopathy. Higher magnification analysis of h-tau aggregates revealed presence of NFTs, with morphology similar to what Alois Alzheimer had originally described. “Drosophila h-tau models so far were regarded as NFT-free models and several studies have been performed based on this inference. Hence, we had to be extremely careful while designing our experiments and interpreting the data. We had to include several experimental replicates to decisively demonstrate the NFT-mediated pathogenesis of human tauopathies in Drosophila,” says Sarkar. Additionally, it was seen that the incidence of these NFTs was heightened around degenerated neuronal tissues. A linear correlation was seen between the amount of flame-shaped (advanced stage) NFTs and severity of the disease. The most interesting finding of this study is the relationship between NFT formation and expression of the gene dMyc ( Drosophila homolog of human c-myc proto-oncogene). In larval eye discs, h-tau expression increased when dMyc was selectively upregulated in cells expressing wild type h-tau. Additionally, tissue-specific down regulation of dMyc by RNA interference reduced NFT formation. The important conclusion of this study was that aggregation of hyperphosphorylated and normal tau as NFTs resulted in pathogenesis and neuronal death in Drosophila models of human tauopathies, and that regulating dMyc expression was one way of neuronal rescue. Sarkar indicates possible follow-up studies involving large-scale screening of potential drug molecules and gene modifiers that can control NFT formation. This study may have involved just a glimpse into the Drosophila eye, but has carved out a whole new vision for the future of neuroscience.